Contemplating Cleveland: Is Trump The Next McKinley? Ted Cruz’s very public reneging on his pledge to support the eventual GOP nominee is being praised by both American Conservative’s Rod Dreher and National Review’s Ramesh Ponnuru [Send him mail], It's hard to think of a more damning indictment than that! But divisions in the party are not worse than divisions in the country. Accordingly, I offer the example of my home city of Cleveland, where the GOP convention is being held, and of a president from my home state of Ohio, William J. McKinley, as evidence that divisions can be healed. And, by a curious coincidence, McKinley’s policies were eerily similar to those of Donald J. Trump. This is not the first time America has been deeply divided. The various crises of the 1850s culminated in a great war in which over 600,000 Americans were killed. And during those various crises, the part of America in which the GOP convention is being held was as partisan as any watcher of FOX News or MSNBC today. Cleveland in 1860 remained what it had been at its founding, a cultural outpost of New England, even though it had received some Irish and German immigration, the forerunner of that great stream of immigration from all over Europe that came later in the nineteenth century and helped create the Cleveland of today. Abraham Lincoln received 58% of the vote in Cleveland in 1860, and he carried 9 of the city’s 11 wards. Lincoln did even better in the more rural parts of Cuyahoga County, where the New England strain remained even stronger. Cleveland was the heart of what had been Connecticut’s Western Reserve, a name that lives on at my college alma mater, Case Western Reserve University. One of the classrooms in which I had classes was Mather Memorial, named for the prominent Cleveland family which was an offshoot of the family that gave us Increase Mather, President of Harvard College, and Cotton Mather, the Puritan writer. Parts of northeast Ohio even look like New England, which is why the producers of The Gathering, a made for TV movie popular when I was young actually shot their film in Chagrin Falls, a lovely suburb east of here, and Hudson, a beautiful suburb of Akron, even though they set it in New England. 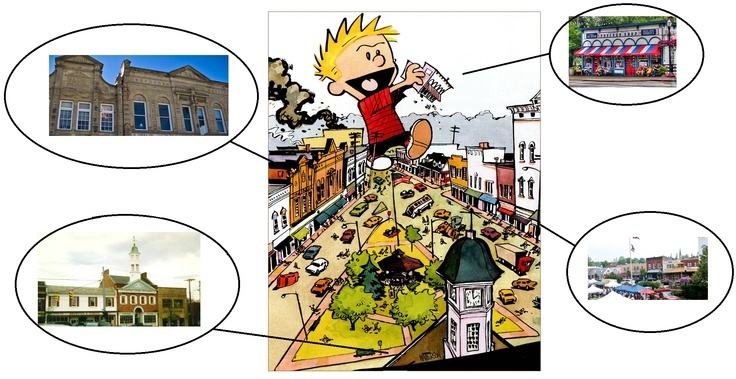 (A further aside I can’t resist: anyone who was a fan of Calvin and Hobbes has seen downtown Chagrin Falls recreated in the beautiful drawings of Bill Watterson, who grew up in Chagrin Falls). Unfortunately, northeast Ohio was also the home of John Brown during much of his peripatetic life: his family moved to Hudson when he was five, and he also lived in Kent and in Akron, where the house he lived in with his young family has been preserved by the Summit County Historical Society. Given this history, you might think that Clevelanders would receive a sharply negative view of the South in their schools. That may be true today, as even Civil War battlefields are being restructured—one might even say reconstructed—to focus less and less on military tactics and strategy and more and more on slavery, together with such weighty matters as the contributions of Asians and Pacific Islanders to the war, the topic of a National Park Service book I saw recently at the Monacacy National Battlefield in Frederick, Maryland. But no, the view of the Civil War I received, both in my public junior high and my Catholic high school, was that the Civil War was our most honorable war, because it was fought by brave Americans on both sides. The Civil War movie we saw in high school was The Horse Soldiers, a wonderful film by the greatest American director, John Ford. In the movie, John Wayne leads a Union cavalry raid in the South. Both sides fight honorably and even act with gallantry toward their adversaries, and Wayne and the daughter of a local plantation owner fall in love. (Ford also brought out this theme of regional reconciliation in She Wore A Yellow Ribbon, where Wayne leads a funeral service for a Confederate brigadier general who had been serving under Wayne under an assumed name, and the Confederate general is shown being buried with the Battle Flag). Nor was my experience unique. A local high school, Willoughby South, competes on the sports fields as the Rebels, with a caricature of Johnny Reb as the mascot—a prospect that surely causes John Brown’s body to lie a- spinning in the grave. The irenic view of the Civil War I was taught was the result, in part, of far better ideas that sprang up in northeast Ohio than those of John Brown—namely, the nationalism of Canton’s William McKinley and of his campaign manager, Cleveland’s Marcus Alonzo Hanna. All the circumstances of McKinley’s youth had favored his adherence to the Republican principle of the protective tariff. The very village of his birth had been named for Hezekiah Niles, an early protectionist. The duty on foreign iron had not been an abstract idea to an ironfounder’s son, but the source of bread and butter, and memories of want rang in McKinley’s phrases when he spoke of the low-tariff years of his boyhood…He carried to Congress an emotional conviction that the solution for all the country’s economic ills was to make the already high tariff rates higher. There is a transcendental philosophy of free trade with devotees as ardent as any of those who preach the millennium…Free trade abjures patriotism and boasts of cosmopolitanism. It regards the labor of our own people with no more favor than that of the barbarian on the Danube or the coolie on the Ganges. …In the mind of every workingman is the thought that this great American doctrine of protection is associated with wages and work and linked with home, family, country, and prosperity… The people of this country want an industrial policy that is for America and Americans. So complete was McKinley’s identification with protectionism that one of the bald eagles that admirers brought to Canton to give him during the campaign was named “Protection.” (That eagle was donated to the Canton Zoo, as were the other eagles, “McKinley” and “Republican.” Alas, none of the eagles was named “Checkers.”). McKinley went even further after he became president. In a speech in Atlanta in December 1898, McKinley indicated his support for the federal government’s assisting in the care of Confederate graves: “Every soldier’s grave made during our unfortunate Civil War is a tribute to American valor.” That is exactly the lesson I learned in the same part of America McKinley came from many decades later. The cordial feeling now happily existing between North and South prompts this gracious act, and if it needed further justification, it is found in the gallant loyalty to the Union and the flag so conspicuously shown in the year just past by the sons and grandsons of these heroic dead. What a glorious future awaits us if unitedly, wisely and bravely we face the new problems now pressing upon us, determined to solve them for right and humanity. Of course, the valor shown by Southerners in the Spanish-American War, so appreciated by McKinley, has been repeated in all of our wars since then. McKinley, then, enjoyed success in his goal of helping to unite Americans. He also enjoyed considerable success economically. As Pat Buchanan notes, McKinley in his first term “presided over a 75 percent rise in the Dow Jones Industrial Average, a near tripling of union membership to 1. 1 million, and a reduction in the unemployment rate from 14 percent to 4 percent. In McKinley’s first term, the U. S. economy [grew] by an average of 7 percent a year.” These economic results were representative of how the American economy performed under the sort of trade policy favored by McKinley, as the statistics marshaled by Buchanan show. Between 1870 and 1913, the annual growth of the U. S. economy averaged more than 4 percent a year and we went from having half of Britain’s production to having more than twice Britain’s production. It is true that, through much of this period, the industrial production of the United States was centered in the North East and what became the industrial Midwest, the Midwestern cities circling the Great Lakes, including Cleveland, and the areas surrounding them. But, over time, the prosperity created behind tariff walls spread to all parts of the country. Birmingham, Alabama became as much associated with steel production as Pittsburgh, and many textile mills moved to the South. By the time of the debate over NAFTA and GATT in the 1990s, the most vigorous corporate opponent of those trade deals was Roger Milliken, whose factories dotted the South. My good friend from the Buchanan campaign, John Van Sandt, described to me at the time how the prosperity of his hometown of Florence, Alabama depended on the local Ford, Union Carbide, and Reynolds Aluminum plants. What John described corresponded to my own experience here in Cleveland, where I learned at an early age the same lesson William McKinley had, that American prosperity is dependent on a strong manufacturing sector. Over time, the America shaped by the nationalist policies favored by McKinley and those who thought like him became the most powerful, and envied, nation in the world. If we experienced an economic calamity on the scale of the Great Depression today, I fear that our society would come apart. That America, though, held together. America emerged from World War II as the most powerful country on earth. It is fitting that one of the greatest American leaders in that war was the man William Manchester dubbed an American Caesar, Douglas MacArthur. MacArthur, after all, was the living embodiment of the united America McKinley hoped to foster: his father was a Union hero of Missionary Ridge and his mother was a proud daughter of the Confederacy. Perhaps the signature achievement of that America was Neil Armstrong’s landing on the moon in July 20, 1969—almost exactly 45 years ago. As a popular internet post puts it, there are only two kinds of nations: those with the metric system, and those who put a man on the moon. All of that now seems very far away—as remote from us as the Civil War or McKinley’s campaign of 1896. But the ideas championed by William McKinley will help lead us out of the current crisis. By explicitly valuing Americans over foreigners and by valuing each American as an American, McKinley’s nationalism helped promote reconciliation in a country that had, not long before, been literally at war. We did it before. We can do it again.